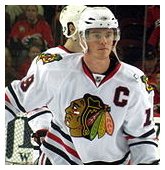 After being selected third overall in the 2006-07 entry draft by the Chicago Blackhawks, Toews has emerged as one of the most skilled centers in the NHL after just two seasons. After helping lead team Canada to a gold medal win during the 2010 Winter Olympics in Vancouver, Toews locked up the Conn Smythe, given to the most valuable player in the NHL playoffs, after playing a crucial role in leading the Chicago Blackhawks to their first Stanley Cup championship since 1961. Toews is currently the youngest captain in the NHL, and has registered more than 65 points in each of his first two seasons. The Green Girls, a group of four web-savvy fifth grade students from Meadowvale Village Public School, are receiving top marks-and a visit from Mayor McCallion-for a website they designed as part of the Green Website Challenge, an educational competition created by Bullfrog Power®. Asking students to design a website exploring the topic of renewable energy, Bullfrog hoped to increase awareness of clean energy and conservation among young people through the Challenge. The Girls’ website, “Green energy: It’s our future now,” was selected the top site and will be linked to Bullfrog’s website as well as the City of Mississauga’s and act as a platform for educating Mississauga residents about green energy and electricity generation. Bullfrog Power and the City of Mississauga teamed up to launch the Green Website Challenge in December 2009. Over 40 students got involved in the project, submitting more than a dozen entries for consideration. Through the Challenge, students were able to learn about how energy from renewable sources compares to energy from non-renewable sources and use their web skills to help educate other Mississauga residents about conserving energy. The Challenge’s panel of judges included Heintzman and the City of Mississauga’s Manager of Energy Management, Rajan Balchandani, and Manager of the Environmental Group, Brenda Osborne. In recognition of their winning submission, the Green Girls and their entire class will receive a special visit from Mayor Hazel McCallion. During the visit, McCallion and Heintzman will present the Green Girls with plaques to celebrate their accomplishment. The Green Girls and their class will also receive a complimentary trip to the Ontario Science Centre where they will participate in the Action Earth program, which explores how humans are affecting the environment. All students who participated in the Challenge will receive certificates of achievement for their web design efforts. Through its Best Buy for Kids program, Best Buy Canada has donated $50,000 to develop a Big Brothers & Big Sisters of Canada national program that is already showing great promise in select communities across the country. The new Teen Mentors Program takes a unique approach by having teens aged 15-17 become mentors for children in elementary school. Teen mentors will act as role models for the children in the program, helping them with their homework while developing a friendship with the younger students. Big Brothers Big Sisters of Canada’s Teen Mentors Program is a natural fit for Best Buy for Kids, developing life and leadership skills in the teen mentors while helping the elementary school children succeed and reach their full potential. Some Big Brothers Big Sisters local agencies have already experienced the positive results of matching teen role models with children, and currently offer a variation of the In-School Teen Mentors Program in schools. With the funding from Best Buy, Big Brothers Big Sisters of Canada will expand this program across the country, reaching over 600 students. Holland Bloorview Kids’ Rehabilitation Hospital has put out a call to budding film-makers to enter filmpossible, a unique online video contest which will showcase the possibilities for children living with disabilities. Film-makers have until Aug. 31 to submit their videos. Working with a class from the Claude Watson School for the Arts, two Holland Bloorview youth ambassadors, Gabriella Carafa and Crystal Chin, helped kick start the contest by creating videos promoting filmpossible. Gabriella has a neuro-muscular disorder that affects her mobility and she uses a wheelchair. While the contest closes August 31st, entrants can increase their chances of becoming a finalist by entering early and encouraging their friends and family to visit filmpossible.ca and vote for their video. Three of the six finalists will be chosen by online public voting, open throughout the entry period. Another three finalists will be selected by a panel of celebrity judges. Winners will be determined by a final round of online public voting in October. Films will be reviewed by a jury consisting of an eclectic mix of people who have come together to embrace this important cause, including experts from the film industry, high profile comics, a singer and an acclaimed journalist and author. First prize winner will receive $5,000; second prize is valued at $500; and third prize is valued at $300. Three honourable mention prize winners will each receive a Flip Video Camcorder donated by Cisco. This entry was posted on Monday, June 21st, 2010 at 12:04 pm and is filed under Action Adventure, Awards, Business News, Careers, Casual, Contests, Digital Products, Education, Educational, Events, Everyone, Everyone 10+, Mobile, National News, New Releases, Puzzle, Shooters, Sports, Teen, Upcoming Releases. You can follow any responses to this entry through the RSS 2.0 feed. You can leave a response, or trackback from your own site.